Recently, I tweeted about middle school kids training and it received a lot of positive feedback. This particular tweet was a result of thoughts I had after spending a short time on social media seeing posts of young kids doing some crazy things in training, and I don’t mean crazy good things, more like crazy bad. One such post was of a middle schooler deadlifting 1.5 times his bodyweight. Impressive, right? Well, not when you see the form he used. I try not to be negative when it comes to others’ content, but sometimes it can be used as a teaching moment. 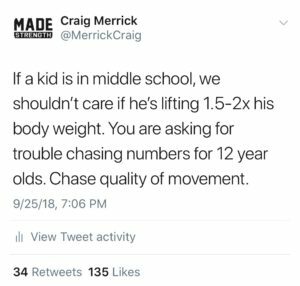 We should not care how much weight a middle school athlete can lift. At this age the movement or exercise should either look good or look like crap (we actually use the other word but we are keeping PG for the blog). Very scientific, right? I think it’s pretty simple when it comes to young kids doing the movement correctly with good technique or the alternative. When a movement or exercise looks bad with this particular population it is bad because the weight is too heavy. Reduce the weight and the movement will clean up. The boys in this particular population are going to test the weight more than the girls. Boys think they have something to prove, they can lift a lot of weight, and this doesn’t change throughout high school either. I guess it’s the macho ego of lifting more than everyone else. However, the young women tend to pay more attention to detail in their movements, and tend to go lighter on the weight. They sometimes have to be encouraged to increase the weight because they are hesitant for fear of not doing it correctly. Remember, we should be chasing the quality of movement, not numbers in the weight room. This shouldn’t just pertain to middle school athletes, but to everyone of all ages. This even goes for the adult population. We should always be chasing this. I remember hearing people say, “in order to get strong, you have to break form.” I could not disagree more with this statement. You don’t have to push the max effort strength principles with this population. Yes, there needs to be progressive overload, but they don’t need to work at 90% of their 1RM. You shouldn’t even know what their 1 rep max is to begin with. You are asking for trouble if you are chasing these types of numbers with kids who are more worried about playing Fortnite, then what their 1RM Deadlift is. I am not against young athletes 11 and up lifting weights (and no it does not stunt their growth); however, we do have several rules we follow for this population. 1) Movement quality must be good. 2) We don’t load the spine axially due to spinal compression of the spine during its developmental stages. 3) No failed reps. You don’t get stronger with failing reps. Talk to anybody that has trained for many years, and I bet you they can’t tell you the last time they failed reps.
4) If the movement looks like “crap” lower the weight. 5) Increase reps before you increase weight. If they are able to do 1 more rep at the same weight than they did the week before, that means they are stronger. 6) Make small incremental weight jumps if able. Don’t increase the weight by too much. They don’t have the development yet to make big weight increases. We also want to make sure we are training biomechanical movements, such as Horizontal/Vertical Push, Horizontal/Vertical Pull, Knee Dominant, Hip Dominant, to name a few, and forego the typical bodybuilding routines. Your 12-year-old son shouldn’t be training Chest and Back on Monday, Bi’s and Tri’s on Tuesday, etc. Please, keep that training back in the 90’s. Another important point I want to stress is that weight training is not the be all end all for this particular group. They need to sprint, jump, and throw things, as well, in their workouts. Sprinting will help increase their strength, especially when they are new to training. When they are in this developmental stage, any and all external stimuli will have an effect, but it is our jobs as coaches to make sure the external stimulus is done correctly and the effects will be positive.